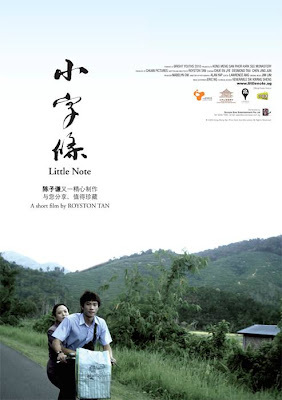 in conjuction with the release of Royston Tan's latest short film "Little Note", we will be holding a little contest! "If you could write a Little Note to a loved one, what would it say?" drop us a reply to that question and the top 3 best note-writers will win a "Little Note" DVD + an autographed poster by Royston Tan. the contest will end on Sat 17/10. live with reality and imagination. live your life and loves. Live High Live Strong Live Mighty. Nobody can take away what we have together nor our attitude in life. but this will be the ending note. what we've left behind is long gone. i will be missing you, nevertheless. Ok so the contest closes today but I'll just try...for luck. "Sorry I had a little taste of the bitter stick and filled my lungs with white. I exhaled my problems but it didn't make it alright. A whole lot of little bit"